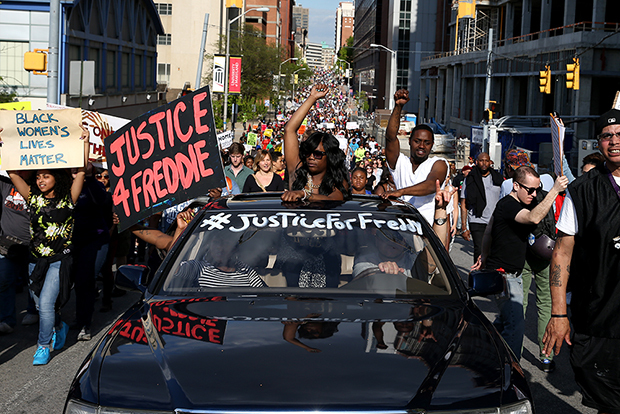 Protesters march on the street from City Hall a day after Baltimore authorities released a report on the death of Freddie Gray, May 2, 2015 in Baltimore, Maryland. My friend is well educated and is, in most respects, a reasonable person. But like many other Chinese, he has a facile preconceived set of notions about black people that stem from a historical lack of contact. There’s little or no effort here to distinguish between Africans, African-Americans, African-Europeans, Afro-Caribbeans, or recent African migrants to China. They all fall under a homogenous umbrella—hei ren, or “black person”—attended by a variety of sweeping stereotypes, including a proclivity for violence and crime. Chinese media has not ignored recent events in Baltimore, an exception to its usual practice of playing down or ignoring reports involving social unrest. It was something altogether different from the U.S. media’s coverage of grief, rage, and frustration about Freddie Gray’s death, the protests and riots in response to it, and the responses to those responses. Consistently criticized by the United States for its human rights abuses, China seems to be taking pleasure in pointing out American hypocrisy. On April 30, the Communist Party’s major news organ, the People’s Daily, published a scathing commentary. “Each time, when the hatreds old and new of U.S. racial contradictions boil over,” the article read, “it clearly tells the world that the declaration ‘all are born equal’ in this so-called ‘field of dreams’ still has yet to take root.” Naturally, there is no mention of China’s own issues with ethnic tensions and cultural discrimination, from cracking down on the Muslim Uighur minority in Xinjiang to persecuting Buddhist monks in Tibet. More interesting than the column itself was the spate of revealing and troubling responses from Chinese netizens that it generated. (As a general rule, only aging Party members actually read the People’s Daily.) Netizen commentary to the (relatively boilerplate) Baltimore reporting on the major online news portals, from NetEase, to Sina News, to QQ News, was overwhelmingly negative and often downright ugly. While comment sections are inherently polarizing and generally only attract people eager to express strong opinions, the sheer number of posts and the amount of support they garnered in likes and shares indicate that the comments reflect, to some degree, wider cultural attitudes. I currently live in Jinhua, a prefecture-level city of 5.3 million in central China, on a Fulbright grant researching African student-entrepreneurs in China. Most of my research contacts are Africans who study in greater Zhejiang province while also working in the nearby trade cities of Yiwu, which has China’s second-largest African population, and Guangzhou, which has the largest. They tell me they encounter a wide array of responses when it comes to the color of their skin. These fall on a spectrum ranging from awkward curiosity—requests to touch their hair are relatively common—to overt racism. A growing number of black people—in particular, traders from African countries—are indeed moving into China. Guangzhou, a massive city in the country’s south, houses Asia’s largest African population. According to local officials in Guangzhou, 16,000 Africans legally resided in the city in 2014. Experts estimate the total number of Africans living in Guangzhou—legally and illegally—lies somewhere between 20,000 and 200,000. Debate is fierce about just how many Africans live there, and no one knows how many Africans live in China overall, but few dispute that the steady influx of African immigrants into Guangzhou since the late 1990s has led to growing tension between local and African communities. Africans are routinely characterized as illegal workers responsible for a rise in robbery, drug dealing, gang activity, and general disturbances of the peace, and are subject to random visa inspections by local police. The African community has taken to the streets to demonstrate against unfair treatment—in 2009 following the death of a Nigerian man who jumped from a window trying to escape a police raid, then again in 2012 when an African man died mysteriously in police custody. Many comments on articles about the Baltimore protests mentioned these African immigrants, drawing an implicit connection between one and the other. Commenters called them “out of control,” and a “hidden danger to the future public safety of our country.” Another warned, “Black people love to make trouble.” There were far worse comments, not fit for print. Many were written out of a professed concern for Guangzhou. Although there are no available statistics for African crime in Guangzhou, crimes committed by foreigners tend to attract disproportionate media attention.